ViviscalTM PRO hair growth supplement contains the key nutrients you need to nourish thinning hair from within. ViviscalTM PRO is 100% drug-free. ViviscalTM PRO ingredients include the exclusive proprietary AminoMar C™ marine complex. 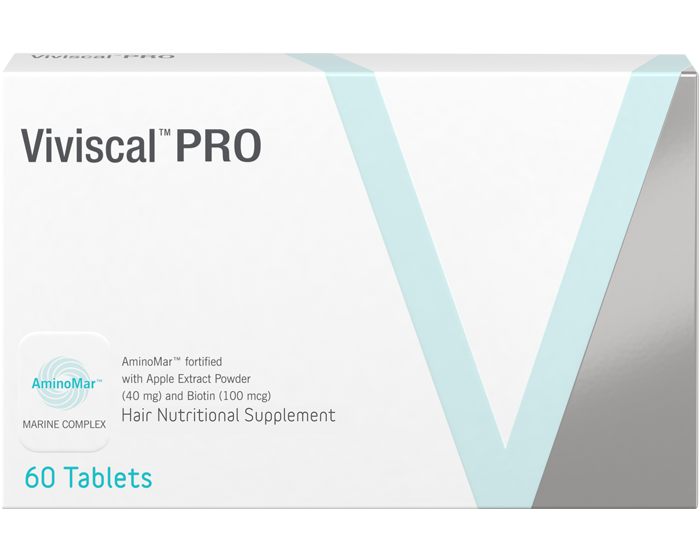 ViviscalTM PRO hair growth supplement supplies vital nutrients to the hair follicle to prolong the hair growth cycle. Users may notice a difference in as little as 3 or 4 months. of women noticed an increased in their hair volume. would recommend ViviscalTM PRO to a friend of family member. reported very positive feelings about having thicker, fuller, looking hair, stating: Boosts My Confidence, Feels More Attractive, Feels Younger. of women noticed an increased in their hair thickness and rated the product easy-to-use. BE WARY OF UNAUTHORISED ONLINE SELLERS.